Boost your transformation and innovation projects with diagrams, blueprints, roadmaps, landscapes. Dragon1 PRO is the edition of the Dragon1 Collaboration Platform (creating products for your owner/client and stakeholders) that is fit for purpose for a freelancer, contractor or consultant to be used as EA Tool, Process Modeling Tool and/or Project Management Tool. 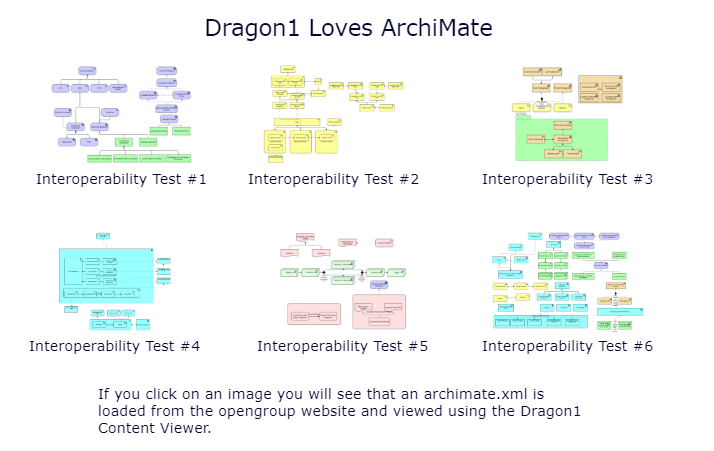 Dragon1 has its own repository and supports using languages such as UML, BPMN, ArchiMate, TOGAF. As Dragon1 is an online saas platform, you can collaborate with team members, other departments or offices abroad. And most important: Dragon1 supports you to work with enterprise architecture throughout the organization. You create holistic, interactive and click through visualizations of concept design, innovation, business modeling, IT management, enterprise architecture, project management, etc. The PRO Edition of Dragon1 has its Architecture Repository, so all your architecture data is importable, storable and manageable in 1 database. If a change occurs in the data that change is immediately processed in your created products (unless you set a rule not to do this or want to evaluate each change separately). Dragon1 supports working with data entities that are marked Single Source of Truth. Only one version of that data entity can then occur and be reused in your repository. 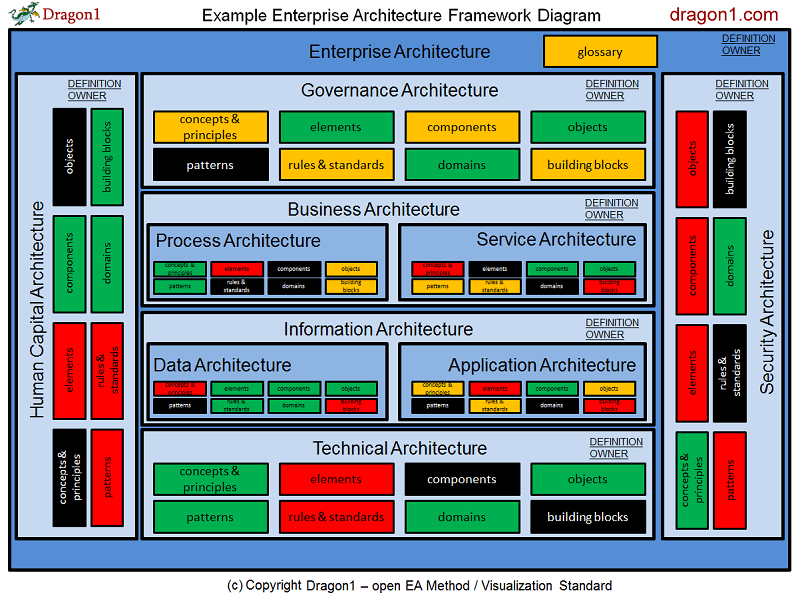 Dragon1 foremost is Enterprise Architecture software. Fit for purpose for designing, creating and generating models, views and visualizations of concepts, principles, building blocks that help support decision-making and guide projects. The suite of web applications of Dragon1 PRO support you in doing these activities. The key features of the applications enable you to create the key products you need in your work. A lot of example content is available to make it easy to make start. 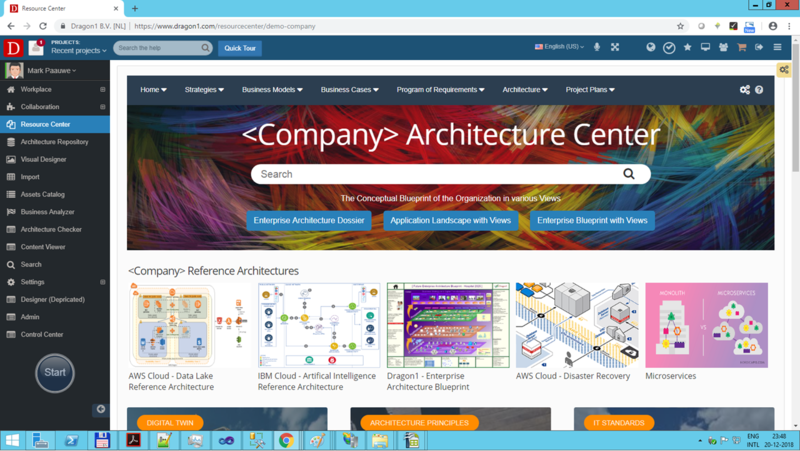 ARCHITECTURE CENTER - Publish the document and visualizations in an accessible way on your intranet to the stakeholders and projects. If you want to compare all features of the different editions, read the Editions overview page. 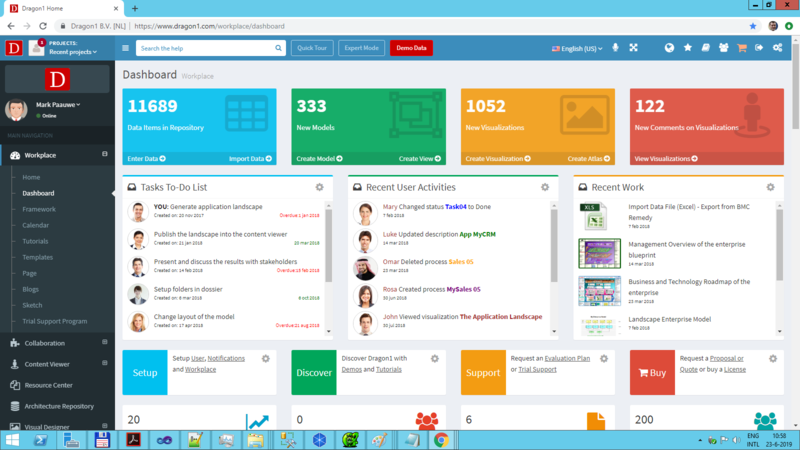 Per Dragon1 Application, the key features for every web application has been listed. On Dragon1 PRO we have a set of templates so you can quickly generate visualizations with high quality. You can enter data manually or import your Excel or Visio data, create a model and views and link it to the template. 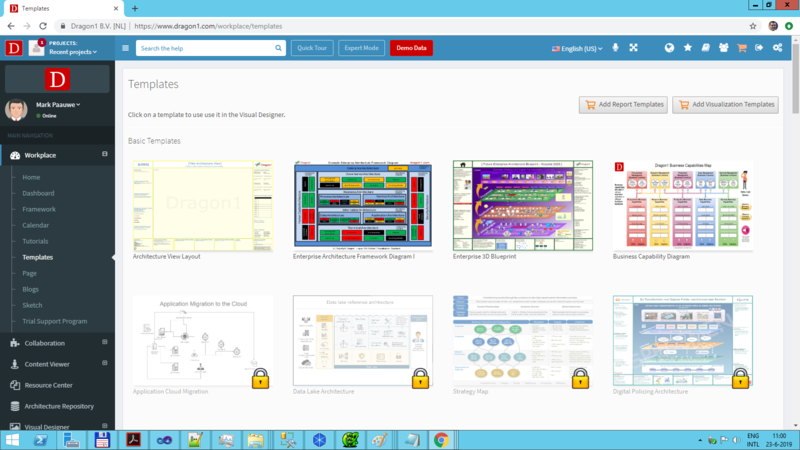 The most used templates on Dragon1 PRO are: Application Landscape, Process Landscape, Business Capability Landscape, Enterprise Architecture Framework. And we have many more templates waiting for you. On Dragon1 we have made it easy for you create multiple views per models and link the views to clickable buttons on visualizations. Read about our special PRO feature: dynamic views, to get even more out of your templates. To make it easy for you to create architecture visualizations, we provide several tutorials, like this detailed one on creating an application landscape with views. Why should you want to work with an online EA Tool, BPM Tool or PM Tool like Dragon1? First of all: Dragon1 beats working with Excel, PowerPoint, Visio and freeware modeling tools, as they are not meant to support working with architecture. They do not increase your productivity or guide you in creating stakeholder oriented views of the architecture with high-quality data. 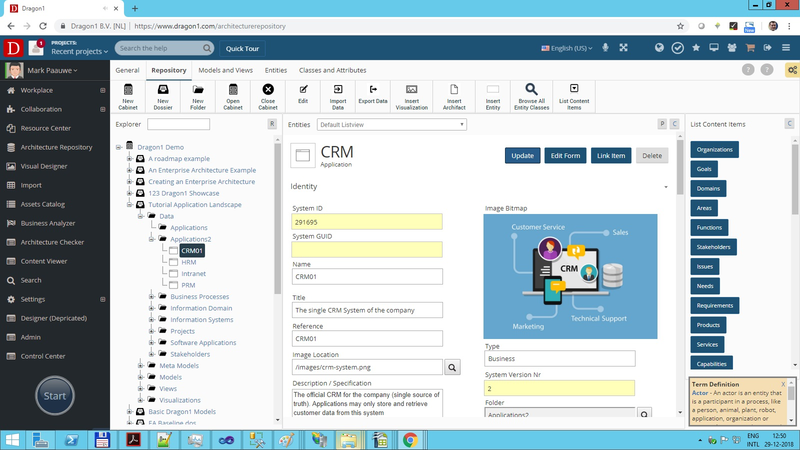 Dragon1 has everything a business professional needs and wants in an online business platform: Visio & Excel import, templates, tutorials, examples and checklists. All these ingredients make you much more productive. The database repository makes sure your data is of higher quality and you reuse data more often. 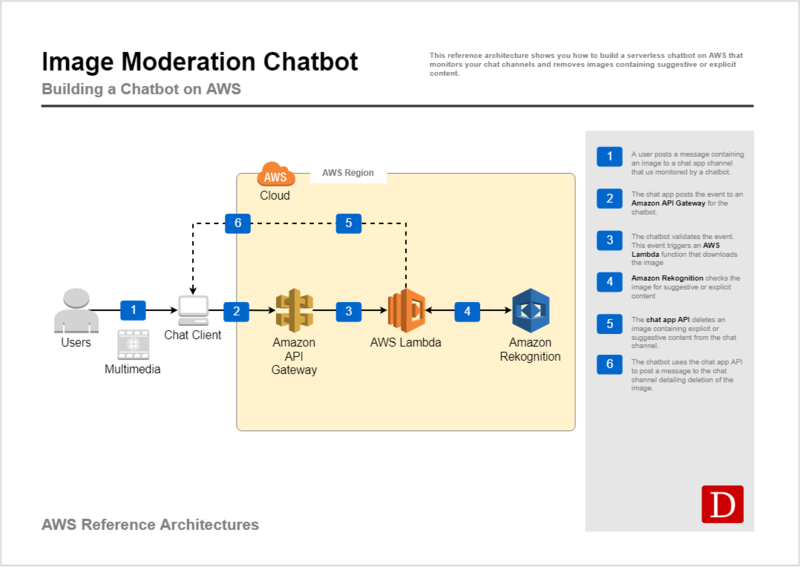 The fact that Dragon1 is online will increase your sustainability and the fact that you can visualize architecture in a context of strategy and transition enables you to control risks more. And because we have added gamification, Dragon1 is also more easy to use than other tools. 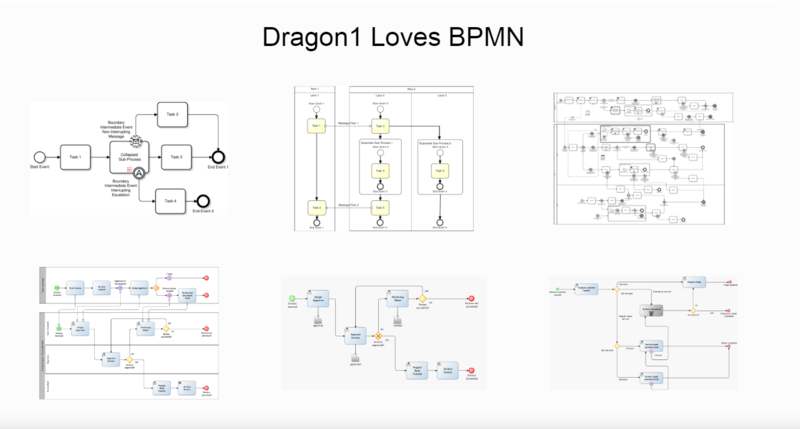 So you have every reason to choose Dragon1 as your EA Tool, BPM Tool or PM Tool! Increase operational result by reducing process dependencies using overviews. Increase customer experience by implementing strategic changes successfully using road maps. Expand to new markets by successfully introducing a new product using integral solution designs. 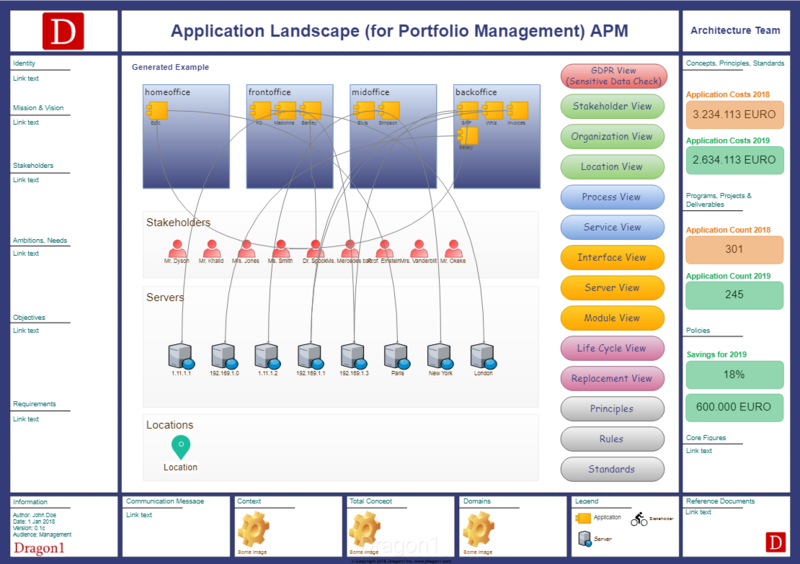 Manage projects risks better because their all made visual using landscape maps. Be more productive: work anytime, anyplace, anywhere using an online platform. By creating architecture diagrams with high-quality data, your management is provided with visuals that lead to making better decisions on financial management, strategic management, investment management and more. Dragon1 consists of several web applications. 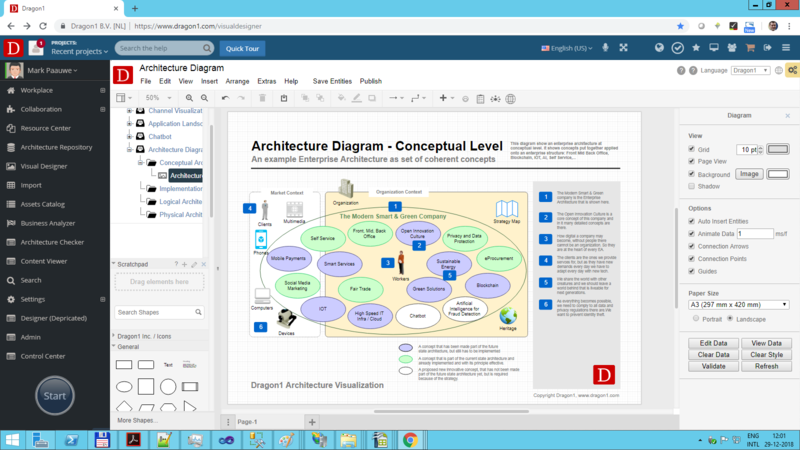 These Dragon1 Applications are to model and share holistic, static or dynamic and interactive / click through products like interactive views of diagrams, landscapes, blueprints and roadmaps. Dragon1 provides a Task Manager in the Digital Workplace enabling workflow and efficient collaboration online with. Collaborate online, see your To-Do list, tasks, progress and work created. With visually and effectively together using a Kanban Board and Team Builder. Create a single source of truth for your architecture data. Import and export data. Build up an Enterprise Architecture dossier. Create, enter and reuse data entities, relationships and models. Create architecture diagrams, concepts and principles diagrams, ArchiMate views and viewpoints and BPMN models. Create template visualizations to generate landscapes and blueprints with. Share visualizations with stakeholders and design visualizations for the projects. 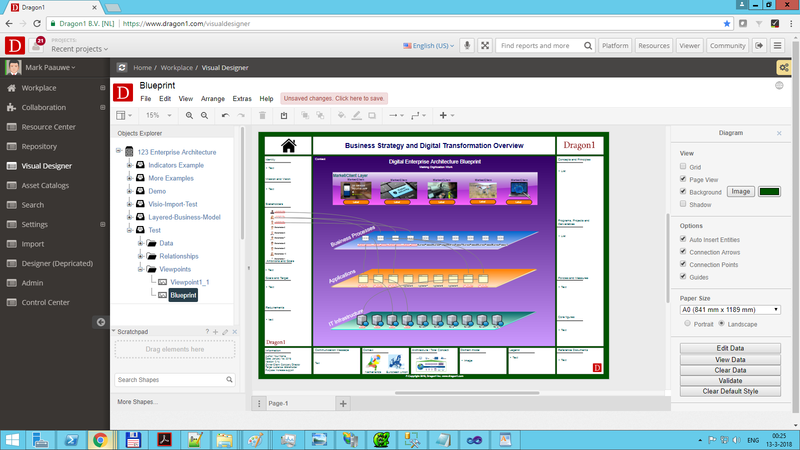 Dragon1 PRO is used to model and share interactive Visualizations such as Business Diagrams. Below are some visual examples of products created using the Dragon1 PRO. Starting point for creating architecture visualizations. 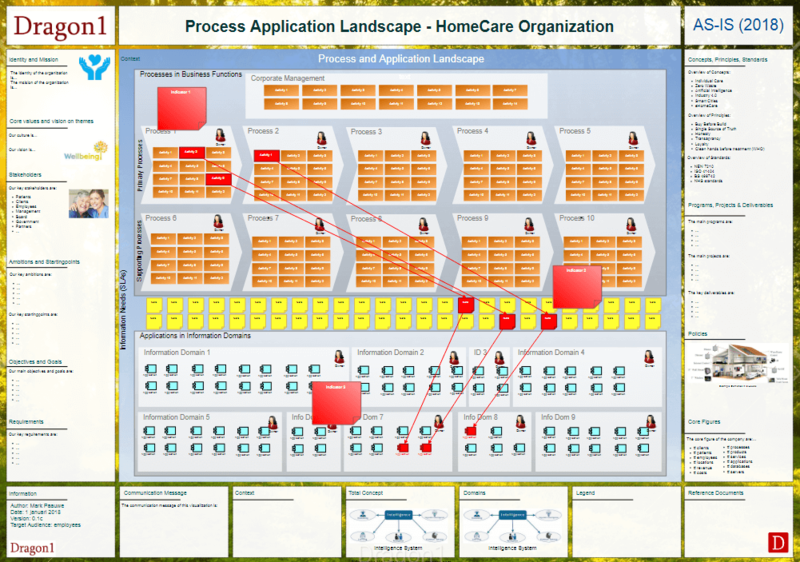 See the impact of applications on the processes. A Dragon1 Atlas with a set of published ArchiMate Diagrams. A set of interactive process models compliant to the BPMN standard. Are you interested in working with Dragon1 PRO? Sign up for a subscription, see here the page about the Pricing Plans and Editions.